The Scottish Salmon Company (SSC) has announced the submission of a scoping report for a new North Arran Marine Fish Farm. 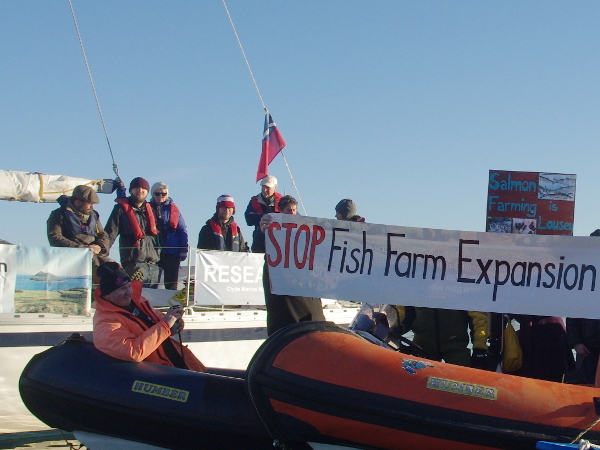 Please sign and share this petition if you are opposed to the expansion of the open cage fish farm industry in the seas around Arran. In this year, The International Year of the Salmon, David Attenborough calls for our wild salmon to be protected from the sea lice infestations, disease and deliberate untreated pollution from open cage salmon farms, which threatens their continued existence in Scotland and other parts of the world. In this video he makes a heartfelt plea for us to take responsibility and mitigate man-made impacts and this includes halting open cage salmon farm feedlot expansion in Scotland until the industry can prove itself sustainable. Infestations of sea lice occur where salmon are stocked in pens in our seas and they eat wild salmon smolts and farmed salmon alive; their effect can be seen on the flesh of the farmed salmon in the David Attenborough video. Additionally, worldwide outdoor retail outlet, Patagonia, have announced the release of Artifishal – a documentary that serves a reminder about sustainability at sea. Artifishal – a Liars & Thieves! Production – is a film about people, rivers, and the fight for the future of wild fish and the environment that supports them. It explores wild salmon’s slide toward extinction, threats posed by fish hatcheries and fish farms, and our continued loss of faith in nature. The trailer is available to watch here, with the film soon to be shown in Patagonia stores, at film festivals, community events and theatres. The official government figures for sea lice infestation in Scottish salmon farms, compiled by Corin Smith, for the March 2019 monthly ranking of Scottish salmon farms has the SSC holding the top four places as the liciest salmon company in Scotland. Do we want this or any other company expanding their feedlot open cage farms in the seas around Arran? Prior to submitting their planning application the SSC held a public engagement PR event at Lochranza Village Hall on Tuesday 2nd April to listen to feedback from the local community regarding the proposed North Arran development. We asked that parties opposed to this development attended the event at 2pm, to turn the industry PR event into a public meeting and ensure opinions were heard. Those people and organisations who could not attend during the working day were asked to attend at 17:30, when COAST were again in attendance. The Island community were left outraged when the Scottish Salmon Company refused to answer their questions and labelled them as a “rabble”. Read our press release regarding the meeting to find out more. The salmon feedlot shown on the supplied plans, that will be situated off the north-east coast of Arran by Millstone Point, looks set to include two groups of 10 open cages, each of 120m circumference and 10m depth with an estimated 5000 tonne standing biomass (>700,000 salmon), this is more than four times the size of their existing farm in Lamlash Bay, Arran. The cages are not the only infrastructure for the development; other key components listed within the scoping report include a Feed Barge with 600 tonne automatic feed capacity, 240W LED cage lights and bird nets supported by five 16m high support poles. The SSC wish to have the option to install marine noise creating Acoustic Deterrent Devices (ADDs) to deter seals and to have the option to shoot ‘rogue’ seals. These ADDs are considered illegal, as they disturb whale, dolphin and porpoise and yet are used widely by the industry across Scotland; for more information please visit this ADD petition site. This development will be a noisy eyesore along a part of Arran’s coast, which currently remains unspoilt and is a favourite part of the Arran Coastal Way for the visitors who are vital to sustaining our island’s economy. The SSC propose to use their standard regime of sea lice and disease management, which includes the use of pesticides in feed and hydrogen peroxide baths along with jet washing (hydrolicing) and heat treating (thermolicing). To give you some idea of what a SSC farm of about a third of the capacity of the North Arran farm looks like when the salmon are being deloused, by being sucked through a hydrolicer and also treated with peroxide, please view this video on Facebook of the Strondoir Bay farm situated in Loch Fyne. In addition the SSC propose, at this new site, to continue the use of wild wrasse as lice cleaner fish even though the industry knows this to be unsustainable. Some salmon farm companies have been acquiring wild wrasse from southern England because Scottish wrasse have been fished so hard for the salmon farms in recent years. In fact, wild wrasse acquired legally from licensed fishers are used from the South Arran Marine Protected Area by the SSC under a voluntary code, however the open season for wrasse fishing coincides with their peak nesting and breeding season. This unregulated wrasse fishing is why COAST, as part of the national Wrasse Working Group, are calling for statutory regulation measures to protect Scotland’s keystone wrasse species. Please see this document from the Sustainable Inshore Fisheries Trust (SIFT) for further information on why the management of the wrasse fishery is vital to avoiding over-exploitation of one of our keystone species. COAST are opposed to this development and opposed to the three major developments proposed by MOWI (Marine Harvest) in Kilbrannan Sound, the four sea trout farms off Cumbrae and the plethora of existing open-cage SSC farms in Loch Fyne. The Scottish Government, Scottish Environmental Protection Agency and local planning authorities have stated that they do not know the risk of the cumulative effects of these farms on the health and welfare of our seas and our health, and yet the industry is set to double in size by 2030 with the full support of the Scottish Government. Here is a Corin Smith video asking us ‘What is the cost of eating farmed Scottish salmon?’ showing the state of the industry in Scotland, the SSC farm in Loch Roag and their dead diseased salmon dumped in landfill on North Uist. For further information, please view our Salmon Aquaculture leaflet. This was compiled for the St Molios expansion campaign, however recommended actions one can take are relevant to this proposed North Arran development as well.